The introduction of the Beolink 1000 marked the start of a period of integration in the B&O range. Although it was not the first remote control which B&O offered that could operate both audio and video sources, it brought to an end a period where there had been a large number of confusing and incompatible remote control standards in the audio and video ranges. Text copyright © Beocentral. Unauthorised reproduction prohibited. The Beolink 1000 was an example of really good design. It was sturdy, made from 3 die castings, and simple to operate. The LCD function indicator from the previous A/V Terminal was removed, and the software was instead geared towards rapid, logical operation. 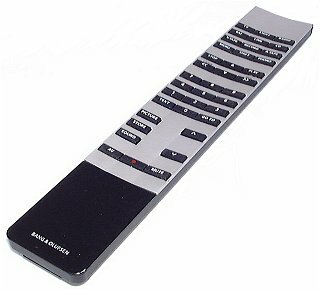 The relatively small number of buttons and the compact size set the Beolink 1000 apart from remote controls offered by competing manufacturers, and the design endured relatively unchanged for many years until the Beo 4 terminal was introduced. Text copyright © Beocentral. Unauthorised reproduction prohibited. Of course there were many detail changes throughout the years to keep pace with new products. The most important of these changes took place when the Mk 3 model was replaced by the Mk 4. The Mk 4 models were recognisable by their slightly lighter coloured fascia, which was now more silver than grey. There were new keys, for example , which operated the LC 1 and LC 2 light controls, which had previously been accessed by Shift, Link Also new was the Menu key, an important function which previously been obtainable only by Shift, Text. Some less important keys were removed to make room for the new additions: Turn became Shift, Sound, Reset became Shift, Mute. Text copyright © Beocentral. Unauthorised reproduction prohibited. The Beolink 1000 was normally included with the Beovision TV sets of the period (except the more elaborate ones that in some markets came with the Beolink 5000), but had to be bought separately for audio products. Extra Beolink 1000s could also be bought for use in multiroom Beolink systems. Text copyright © Beocentral. Unauthorised reproduction prohibited.